Ever had your iPhone get stuck in Headphone mode? 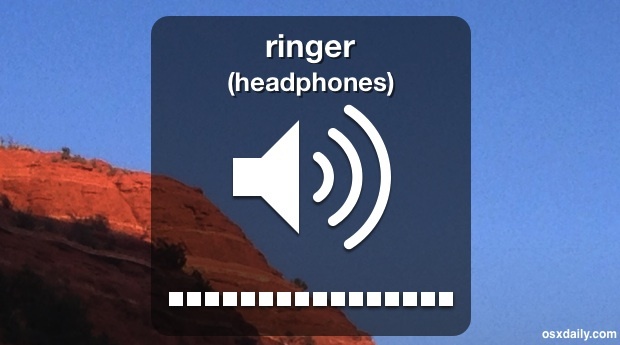 The symptoms are fairly obvious; you go to change the volume level and the little volume indicator says “ringer (headphones)” like shown below, and no audio our sound works through the normal speaker output. Some people interpret this as their iPhone speakers suddenly not working or that something is broken, but that is actually pretty rare, and you can usually fix the issue really quickly with nothing but a q-tip and a set of headphones or earbuds (yes, you read that right, you will use a pair of headphones to get the iPhone out of Headphone mode). I ran into this today and here’s how I fixed it in about a minute. The iPhone should be good to go now. 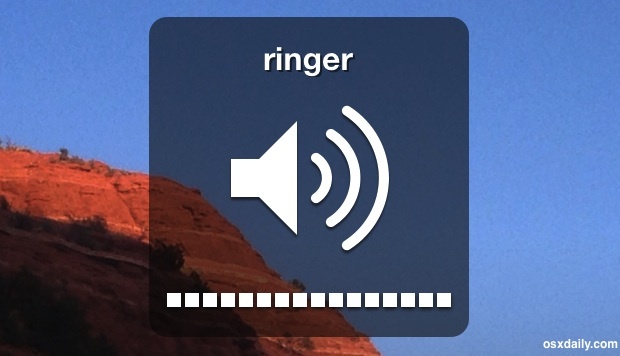 Toggling the volume up/down buttons should just show “Ringer” as it’s supposed to like the screenshot shows below, and audio will play out of the iPhone speakers as usual. Why does this happen? It could be a number of things, perhaps it’s just a weird software quirk where the iPhone doesn’t recognize that headphones have been disconnected from the jack – that seems to be exacerbated by some protective cases that cause obstruction to the audio jack, thus why you should remove the case before trying any of this. It could even be something physical stuck in there like a piece of lint, thus the usage of blowing air in there and swabbing around with the q-tip. Thankfully, it’s easy to fix in the vast majority of encounters, though there are some cases where Headphone mode gets stuck on after an iPhone has had water contact (which is probably why earlier iPhone models has water sensors in the headphone jack) but if an iPhone is properly handled after water contact you can usually save it from damage or any quirks like that. Having helped a reader resolve this problem a few weeks back, and then running into it myself, I figured it was worth a write up. So if you find your iPhone speakers suddenly aren’t working and the “(headphones)” message is stuck on despite nothing attached to the phone, try the steps outlined above before calling Apple Support, it will probably work for you too. I dropped my iPhone 4 when the headphones where still in, now when I try to listen to music the headphone jack won’t work, how do I fix it? I spent 2 hrs trying everything suggested – this was the only thing that worked!! Thanks!! This happened to me too, so I feel your pain. Did you ever figure out how to solve it? Thanks a lot ! it work for me! Wow, somebody is awfully pissy today. yeah I would be too so stop I bet you would be too also. but thankfully it worked for me. I had same problem.. its not the jack next to jack is a tiny hole for microphone cleaned it by blowing in it worked in seconds.. if real bad need a thin wire to insert in it..
ohhh man wtf. That worked flawlessly. Thank you so much!! Thanks! That worked! I tried rebooting 3 x’s, resetting all settings, blow dryer, q-tip, and putting in and pulling out headphone jacks 15 times (which was verizon’s suggestion), to no avail. Verizon is useless. Just one of the tiny speaker holes was clogged, used a safety pin to unclog it, and it worked immediately. This worked perfectly. I tried everything else but when i started to stick the pen in the speaker holes, it started to get louder. Thank you! BRILLIANT!!!!!!!!!! Worked IMMEDIATELY! YAY from Wisconsin!!! Thank you so much this totally worked!!! Wow this worked for me, was in total despair as the microphone jack bit didn’t work and then voila! Thank you, thank you, THANK YOU! a pipe cleaner (one of those art and craft things) worked wonders for me!!!! Well done man, is it amazing how fast it worked. Thank you!!! by the way whoever post this original “how to fix iPhone stuck in headphone mode” really need to get their shyt together and stop wasting other people’s time. Yeah. I noticed that those spots were a bit wet when i tried to dry out the jack port. Anyway drying the whole bottom part of the phone did the trick. OH MY GOD! It worked Immediately!!!!!! THANK YOU SO FREAKING MUCH! can we bump this as the top comment?! This totally worked for me when the original tip did not. Thank you so much! Kia Ora, I tried this and it worked! Thank you. I did use a 3 band plug so not sure if this was a factor too. Saved me a trip out to the hardware shop to buy compressed air…. Wonderful n thank u very very much…. When nothing else I found on the internet, this did! Thank you so much! The q-tip did the trick. I just had to pull off a bit of the cotton in order to fit it into the headphone jack. Great solution, thanks! I tried both of the options and still hasn’t worked. The volume control on the side of the phone only says headphones it does not show ringer. I just got this phone 3 days ago. Iv tried the plenty of times plus iv tried other things but nothing… It would work but as soon as I put my charger in it starts acting up, iv cleaned the phone top to bottom and it’s all fully updated… Hmmm need help! It’s driving my mad!! I have that too! I think you just can’t use the sound while it’s plugged in, without headphones. It has happened to me twice and this quick fix has worked wonderfully !! Thanks you saved me from getting in trouble. Worked for me! I tried plenty of tricks online and this worked fine. I had to be rougher than I thought and had to unplug the headphones about a dozen times before it worked itself out. OMG !!! i loveee you sooo much !!! i dropped my phone in water and it kept saying it was in headphone mode ! i did what you suggested and it worked !!!! thank you soooooo much !!! I dropped my iPhone 6+ in water this morning and my headphone was stuck on. I used a Q-tip as suggested and now it is fixed! Thanks again. I am overjoyed to have found this tip…the QTip! A water bottle tipped in my purse, and some water must have invaded my phone. I shaved a QTip down a bit, inserted it into the phone jack, rotated it, and the video of my grandson could be heard again! Thanks for saving me a trip to the Apple Store. Just tried it on a 2yr old Iphone and it worked! Thanks so much!! Ha ha ha ha hahahahahahahahah! TWO year old phone?! Try a 5 year old, first version, iPod touch! So old it might as well be antique! What’s worse is that and me 4year old IPhone 3G are hand-me downs from my uncle and GRANDMA! In that order! No offense to you Erin. I had the same experience, Tommy! I was able to unlock the “Headphones Only” by sucking on the earphone jack (seriously, found that tip online in an Apple forum), but it would keep reverting to “Headphones.” We’ll see if the “cut Q-tip” technique works, can’t wait to upgrade & get rid of i-Phone 4! Thank you so much that worked great! Thank you for this great tip. I finally fixed my Iphone!!! Dropped hot water on my phone and now it’s stuck on earphones mode. But I can hear the phone calls! Cutting off the end of a Q-Tip and sticking it in the headphone jack and moving it around got some gunk out and I pressed the tiny button on the inside of the jack and that seemed to do something. FIXED! Little button worked when nothing else did! You rock! Much appreciated! My phone was stuck on headphones after getting an Amber Alert while talking on phone. I have never used headphone jack,nor was was there dirt in it,so I think it was a software glitch. I tried plugging headphones in with case on and it didn’t solve the problem, but did with case off!!! It worked! I was about to lose hope, but it worked! Just got to so it a few times and it works! Thank you! I had to use the toothpick and then it finally worked. Pulled quite a bit of lint out of the headphone jack. Thanks for the tip! I had someone call me and that seemed to reset the ringer. Tried the other tricks to no avail. I was reading through the tricks getting frustrated that none were working for me. Read this, reached over and called myself. Fixed! Thanks. Thank you. Tried the pulling the headphone in and out several times and nothing. Finally tried a Q-tip and pulled it in and out a few times and it worked. Totally worked with the q-tip! Just had to pull most of the cotton off to get it to fit in! Thanks! I wet my iphone today playing “holi” with friends. It was in my front pocket and my friends dumped a couple of buckets of water on my head. There was also some food grade color that got on my phone and I left it in my damp pocket for over two hours. I come home after that and voila realize that the phone was stuck in headphone mode. Plugging/unplugging headphone 10 times didnt work. Finally used the toothpick method to take food color out of the headphone jack (not sure if there was any) and blow dryer on high setting to dry the phone. This finally did the trick! Spilled wine previous night. Stuck in headphone mode. Used blow dryer and fixed. Thanks! Got juice in my headphone jack, this worked, thanks so much ! How did you get juice in your headphone jack? Thanks so much I got scared because i didn’t wanna have go update my ipad thank you! Thank you so much! At first nothing happened but I did it once more and wala! Thanks you! compressed air!!!!! Got it working in less than 30sec. Thanks! same problem with me….. i cleaned the jack port with nail polish remover and then blown it with hair dryer…… and wollaaah… it worked. !!!! no need to restore or switch it on n off!!!! I tried plugging and unplugging my headphones multiple times and after 30-45 attempts it finally worked!! Thank you! I was so worried I’d broken my phone forever, but your fix worked on the first try. Amazing! It worked! Tks a lot. You’re seriously my favourite person right now. I got caught in a torrential rain storm with my iPhone and thought maybe it had killed the speakers for good. But the qtip worked! Worked on the first try! Thanks! Also, amazing how many people really seemed to take it personally that it didn’t work for them. Used the end of a Q-Tip just had to pull the cotton off to get it to fit in. Stuck it in the headphone jack and moving it around pressed the tiny button on the inside of the jack and that seemed to do something. The headphones now work magic. Thank you all so much. It worked finally when I cut the end of the Q-tip off. It fell in the water whilst brushing my teeth. You all rock! Working for me. Thank you!!! I work on a sweet potato farm and recently I was sitting in the office and I had my phone on the desk here it feel off. The bak of my phone has a few cracks but what has me worried is my sound is stuck in headphone mode. My text tone and music don’t play anymore and I have to talk to people in speaker phone. However I still get my phone call ringtone. I’ve tried everything I have seen to do online. Maybe I’m just not doing it right, I dunno. But does anyone have any suggestions?? I blew into headphone port and it Worked for me. If qtip doesn’t work take a piece of toilet paper and role it so it fits the jack about 1/2 inch to 3/4 then push it down and turn it. This will reach the bottom and with pushing it down it will also clean the sides. This definitely works if the there is dirt in the jack. Worked a treat!! Thank you!! One hard tug of the headphone jack post cotton bud cleansing at job done!!! Thank you so much! My IPhone was stuck in “headphones” mode, and I took off my phone case and it just worked! I don’t even know how a case could do that! Thanks a lot!! It worked!! THANK YOU! I was literally crying until I stuck a q-tip, a napkin, and my headphones in like 80 times in a row. This literally saved my life. Worked on my daughter’s phone! Thanks a lot! Thank you! Thought my speaker was damaged from a little water that got on it when I dropped it brushing my teeth, but it was just stuck in headphone mode from the impact. None of the following (blowing, sucking, hairdryer, qtip) worked for me, but I was certain that it was a headphone jack hardware issue (I opened up phone and disconnected each connection one at a time–only when headphone jack was disconnected did sound/mode return to normal). Thereafter, I used a bike air pump with ball inflation needle, inserted the ball needle into headphone jack and pumped for 1 minute (making sure to move the needle around within the jack). Success, finally!!! This solution worked for me. Thank u…. I tried everything on every site I could find to no avail. Finally trimmed a cotton swap down to fit the hole, sprayed contact cleaner into the hole, stuck the cotton swap in and twirled it around a little, pulled it out, and “success”! It worked. Its magical. Thank god. And you too, i’m really scared if my father know this thing and have to take my phone to apple centre. Thank you so much!!!! Used shop vacuum on head phone jack for 10 seconds, then pushed the volume button. Worked great. Qtip trick works. Gotta pull off a little of the cotton to make it fit. Thank you. It didn’t work at first and got really fustrating but I finally did it! cut the q-tip it definitely works! This has been the third technique I’ve used to try to solve this problem but it is still not changing anything, thanks anyway. As expected, it didn’t work for me. My iPod Touch headphone jack started giving me trouble soon after I purchased it with weird behaviour. Now it seems to be permanently stuck in some partial headphone mode. The volume adjustment shows headphones (with no headphones attached), but there is no sound out of either the speakers or out of the headphones either when they are attached. Also, the inline EarPod controls stopped working soon after purchase. I think my Touch should have been painted yellow! My iPod Touch headphone jack started giving me trouble soon after I purchased it with weird behaviour. Now it seems to be permanently stuck in some partial headphone mode. The volume adjustment shows headphones (with no headphones attached), but there is no sound out of either the speakers or the headphones when they are attached. Clarification: It was on the iPod Touch device itself that the in line controls quit working – not the EarPods. Holy cow. The qtip and sucking on the port for 30 min WORKED. Thank you so much!!!!! Thanks a lot thought I broke something there for a minute. I had something different, where the ear speaker (for normal phone use) just got “stuck” off in iOS 8.0.2 software, even though the software didn’t think the headphones were in the jack. Speakerphone worked fine. Powercycling didn’t help, but oddly, using Voice memo did solve the problem. It’s as if the audio driver got corrupted and the Phone app couldn’t fix it. It worked!!!! Im so happy! thank you!!! Amazing! Stuck on headphone mode after dropping it into the wc (lucky oredi flushed!). Local dealer (PJ, Malaysia) unable to help. Wanted to buy a new phone, but luckily they were out of stock. Went home, checked your site, voila it works!!! Surprised that such a simple thing as blowing into the headphone jack could actually fix the problem, but it did! Thanks for the advice! Work for me, I roll toilet tissue the size of a Q-tip.. Thank you!!!!! You just saved me from buying my third phone this year. My cat spilled coffee on my phone and this tip worked! Got some water in my headphone jack, soaked in rice for a few hours, but I’m having to work. If I put rice only in the headphone jack, what are the chances it will soak enough and begin working again? Also, I saw a post about using compressed air to clear out the headphone jack. Will this be beneficial towards water damage or harm it further? None of those worked and then I remembered I had run in a huge downpour. I used bits of twisted up paper towel and twisted these in the jack – came out wet and hey presto problem solved! Thank you, for the sanity saving fix. Thank you!! Tried blowing and using a paint brush plus the headphones in and out, that didn’t work. then found your article , used a q-tip and firmly pushed headphone plug in and yanked it out. WORKED! I had gotten the phone wet! Thank you! Fixed it in less than 30secs with just duster :) thank you! Had to get some of the cotton off to get it to fit in the jack. Used two q-tips, pretty dirty in there. Then I blew with pursed lips at an angle where it whistled slightly. I was skeptical but it worked! Thanks for the tips. The Q-tip worked like a charm on my iphone6, I had the same problem with my old 4S and it fixed that one too. This worked great!!! I’m so happy!!! 😄 Thank you so much for your help! Totally worked, first time something simple actually works with an Iphone. Cheers for putting this up! Great, this worked for me first try, I thought something in my phone was broken. I was all mad and frustrated about to go to Apple Store 😃 thanks man. Can of ultra duster worked great!! Thanks for the info! Take an earbud and put it inside the jack and take it out, repeat it few times and then check if your phone is out of headphone mode or not. It has solved my problem. It really works. I thought my phone was broken but it was wet and this trick with headphones turned my phone into ringer mode again. Thanks. It took me several tries, but if finally worked. Thanks! It worked!!!!!!! Thank you so much! Awesome! Thanks so much. The Qtip did the trick! It worked for like 2 minutes, now it all chuck up again, and won’t be fixed. Didn’t even used headphones in the first place..
thanks, it worked for me :) try using a toothpick to make sure the little balls on the sides are not sticking. also wipe the dust out from around them, use a flashlight to look down in there! Thank you! Thank you! 1) blow 2) Sticking a q-tip and taking a bit of the cotton off so Q-Tip goes in. Worked great after a couple pokes with a q-tip. Thanks!! One try with this method and it worked! Thank you. Today the poor phone got dropped in the snow, nice white puffy stuff. I first tried to do the headphone removal trick but no luck. A puff of compressed air and water literally squirted out the headphone port and the sound / speaker came back to life. You can also test to see if the speaker is really hosed by going into your ringtones under settings and trying to play a few, in my case the speaker worked so I knew it was not hosed – I think the phone will ring even when a pair of headphones are inserted into the phone. Thanks OS X daily. This worked great. At first it did not, but it was just because the q tip would not go in all the way. I had to take most of the cotton off, but it was fine and worked after that. Thank you. My sister ran into this problem some time ago and we didn’t know how fix it except keeping restarting the phone. Here is the best solution ever to fix it. Thanks a lot. Man thanks! This really worked, took me a few try’s tho. I tried plugging unplugging.. I tried blowing.. I tried restarting the phone.. Nothing really worked but this did… Thanks alot.. I was going mad…!! Tried the hints and tips without success, but went one step further, blasted the hole with a hot hairdryer, and worked straight away. Cheers buddy! It worked. Thanks so much! Life saver really!…. Thank you! I fell on ice with my iPhone 5 in my pocket and it switched to headphones mode. Tried headphones many times, no good. Pulled most of the cotton off a Qtip, stuck it in the headphone jack and wiggled it around several times, and it works! None of the above worked but had a “waxvac” as seen on TV device that actually sucked out a tiny piece of debris and now it works!! I don’t know how this worked, but it did! thank you so much! I used a cocktail stick wrapped around a piece of kitchen roll and just wiped around the inside of the jack, worked straight away. Great. worked in a second. Before you do anything physical to the iPhone, you should always try re-booting. It worked for me and, whilst I’m perfectly happy to use physical means where necessary, it’s always the first port of call for most sudden glitches. I went sledding today and my phone got some snow in it and shut down, when it restarted none of my sound was working and was stuck in “headphone mode”. I tried the qtip and the headphones trick but it didn’t work. HOWEVER, sucking on the headphone jack straight for 30 seconds worked. 😊 thanks! Thanks a lot!!!!! This helped me a lot. Thought I had to send it to Apple or throw it across the room. It’s still not working what should I do :(!!!!! Awesome, Thank you, just fixed my phone. I was shoveling today with phone in side pocket in pants unprotected, must have caused it to get stuck in headphone mode. You’re the man! Thx you! This didn’t work for me when I tried and tried and tried again. So I turned off my phone and worked on it then. When I turned it back on I put in my headphones and then took them out. Now my phone is functioning fine! Thank you! I LOVE YOU. Worked Flawlessly! I can’t believe this works… Thanks a lot! I thought I got my audio jack stuck in my phone…AGAIN. Just did the q-tip trick on my husbands iPhone 6 plus worked! Thanks!!!!! THANK YOU!!!! My 2 year old dropped my new iPhone 6+ in the (luckily clean) toilet and I didn’t know what to do when the sound stopped working! I did your trick and it worked!!!!! My iPhone was also stuck in Headphone mode. Carefully & gently cleaning out the headphone jack with a toothpick solved my problem. I needed to dislodge dust/lint that was packed in the jack. I had a similar problem with the Lightning jack awhile ago, and the toothpick did the trick there, too. I suspect both problems were caused by dust/lint getting into them from my pockets, where I always carry the iPhone. I’m thinking my next protective case needs something to cover those jacks, too. This just happened to me, and I was very distressed. Tried the inserting and removing tactic, nothing. Tried cleaning the port, nothing. Finally, I resorted to the good ‘ole hard restart (home button+power button simaltaneously). Worked. If nothing works, try that. Seems like this tactic fixes a lot of iphone issues. Qtip works wonders!!! Yey!! I’ve got my sound back!! Thanks alot for the tips and help!! Worked first time. Found some lint stuck at the back. Toothpick worked like a charm. Had to do it a few times but it worked, thank you. You da man. Thanks very much. My advice is to do a little more poking around with the toothpick than you feel comfortable with. My dust was buried deep. Worked like a charm – had to do it 3 or 4 times, but it worked! Tried all of the things mentioned. Still of no avail. Even tried shutting down and starting again. So when I do that and the first time I unlock screen, I can hear the sound and then it’s back to the same mode. Canned air! That worked when nothing else would. My husband inserted the straw until it clicked in the headphone jack and squeezed the button on the can for a few seconds and suddenly he had volume control. This worked perfectly! That you so much! I was freaking out!!!! Worked like a charm! Dumb Apple store asked me to come in as a walk-in since they were out of appointments for the day. I did and they told me walk-ins were also full. Short of wanting to kick them for lying, I set an appointment for 6 days later, their next available and left. Now it works, thanks to your help! Very appreciated! I had the same problem today! Used a q tip. No luck. Cut it in half, wiggled the stick part, then it worked again like new. Thanks. Worked for me as well! Just arrived at a resort and my son spilled his juice on my iPad. Saved my holiday and my relationship with my son, as I was in a bad mood! I did all the thing which you told bt it still not working….. Awesome! I dropped my iPhone 6 in water today. I used a piece of cotton to clean the headphone socket and my speaker/ volume works properly again. Saved me the money! I had to rough up, really, really rough up the first little tiny button inside the headphone jack multiple times with a Q-tip that was made of plastic with the cotton swab portion torn off. But then it worked, thank you. I think my phone broke but thnx for trying! Great! Helps a lot! My problem solved! Thanks so much!! Thx so much! It worked!! I cancelled my appt at Apple. Worked great!!! Thanks a million!!! The Q-tip worked straight away for me! Thank you soooo much!!! Omg! I got my sound back!! Thank you, thank you so much for posting!! Thank you! Couple of breaths and a toothpick worked for me today! Thank you so so so much. Really. THANK YOU!! Wow! soooo good! I used a Q-tip without much cotton. Totally worked . Just needed the Q-Tip.. Thank you!!!! Thank you so much!! I was so upset. The qtip worked. Now tell me how to take care of water damage if I ever have it or how to follow you PLEASE! You helped thanks a toothpick did the trick for me. Try shutting the phone off and turning it back on. Worked for me. Thank you so much !! Finally Q-tip worked. Brilliant. I used a cotton tip and inserted into the earphone hole & pulled out, worked straight away. Genius! Had to do it a few times, but now finger is working! Thank u so much! *ringer. Auto correct strikes again! Finally….it took about a half hour or longer doing combos of all things listed in the comments and finally I have sound and HAPPY! Stick with it is what I found. I was getting pretty frustrated because nothing was working for me. I grabbed a tooth pick and started cleaning the holes, which is the mic I think, and I also rubbed the tooth pick around in the headphone jack and next thing you know my sound came back!!! Hopefully what I did helped someone because it’s so frustrating not being able to fix it!!!!! Thank you so much. Easy and working. I’m happy. Thanks a lot. It worked for me with a tooth stick. You’re awesome. Thankyou very much whoever has posted this information. It has helped me. My iPhone 6+ was stucked in headphone mode, I tried q tip,blowing it, plug and unplug the headphone but nothing works. Can please anyone help me to fix it? Unbelievable, after all the unsuccessful tricks, it worked for me. Qtip cleaning did not help as the jack was clean, what really helped was pressing the tiny button inside the jack, for my it was the 2nd from the outside. Extremely happy. My phone got wet unfortunately 😡 and The q-tip trick helped and I kept unplugging the headphones. It worked perfectly on my iphone4. Thanks very much. i spent days w/no to low sound on apps what. the cleaning was not it, the headphones in and out was not it. restoring it was not it. don’t i feel like a donkey? I dropped by iPhone 6 in a puddle of water this morning, it did not break but the sound is on headphones mode, I fixed it but then it just all of a sudden went back to headphones mode. Worked thrice for me. Q tip/cotton usually does the trick, you want to pull cotton from the top of the q tip and rotate it inside the audio jack. This will probably need to be done multiple times and quite forcefully, at that. Requires a lot of patience. Use a blow dryer and repeat above as last resort. Good luck! Thank you. Blowing and poking didn’t work for me but sucking did. Ye Ha. Saved a trip to the Apple Store who would have sorted out my new iPhone’s problem perfectly as they have over the years. Thanks, I removed some of the cotton from a qtip and then it slid right in the headphone jack. I spun it and it came out dirty. I work as a chef so even with a case the phone is exposed to a lot of flour and other debris. Blah blah.. bottom line the stripped down qtip fully cleaned the headphone jack and the thing is working like a champ now. it worked thanks so much !! Awesome. I did wipe off a super tiny amount of water from the jack after following your instructions. I remember it could be from when I refilled my water tumbler this morning. Thank you! OMG THANK YOU, THANK YOU! worked like a charm. Had to clean it with a q tip 3 x but it fixed the problem. Huge thanks! Bounced around the apple forums and other sites before finding the answer here. Used a twisted corner of a paper towel and couldn’t believe how much gunk I got out to get it working. Thanks! I tried everything that was suggested on other websites but this was the only thing that worked! Thanks again! Thanks! I tried everything that was suggested on other websites but this was the only thing that worked! Thanks again!! THANK YOU VERY MUCH for this easy & quick fix! Saved me a trip to the Genius Bar, excellent article!!! Yes if your iPhone is on mute it will not make sounds and the speakers won’t work to make sound because the volume is low, that’s sort of obvious. This is for being stuck in headphone mode it is different. Perfect I understand, that is a great solution, glad you got your iPhone sound working again when it was stuck in the headphone mode! Dec 28, 2015-Thank you for the QTip tip! Worked like a charm! My iPhone 6 was stuck in “headphone” mode after I connected it to my car audio system via the headphone jack. I tried putting in/pulling out headphones multiple times with no luck, tried rebooting by turning phone on and off-nothing. I pulled off some cotton from a Qtip and inserted and pulled it out once and VOILA! Back to Normal! THANK YOU!!! So it worked but now headphones wont work and only my speaker will. I would rather have had it the other way around. Damn you! Thanks tho. It works for me!!! after few tried. Never give up! that the key. Awesome! This worked for me! Cheers! Worked in an instant! Thank you very much for the tip!! Works great !! Thank you !! Hahaha i tried that more than 20 times i was worried that i would damage my headphones jack but i put steel pin in jack and put it to the end some big dust patch which was stick inside came out and it start working thankyou !!! Thanks a lot, even worked the first time I took the headphones out. Boo yah did the trick and saved my phones life.. I was gonna ole yeller down but snap new life. I tried all the tricks that were itemized above and what worked for me was calling myself. Took it out of headphone mode instantly. Thanks NurseC. Great idea! Thnks bro.. It’s working in 15 sec… Thnks again ..
Just cleaned it with pin, it immediately worked. Thanks for the advice. I tried EVERYTHING to get my phone out of headset mode. (BTW, I had not gotten my phone wet…it just went into headset mode on it’s own) I tried the Q-tip….no luck. I tried resetting….no luck. I took the cover off my phone and took a toothpick and really scraped the inside of the headphone jack and voila!…back to speaker mode! Thank you! OMGGGG thank you haha. I did the q-tip then blew in the holes and sucked them then boom. Worked. Seriously thank u. Nothing else worked and j just got this phone yesterday haha. Blow dryer for a few minutes worked (coldest setting). thanks a lot. i just clean it with q-tip and it works right away after that. im so gratefull. tq!! twisted toilet paper into a thin rope that would fit in the jack. Blew into the jack. Put the headphones in and out a bunch of times. Found a pipe cleaner decoration my kids had made me and twisted that around in there a bazziliion times. Kept my phone in an upwards position so that if there was any liquid remaining, it would fall out, not in. I think when I go home I will place it in a bag of rice just to be careful for a few hours. OMG, if this really is fixed, you are the best!!! Thank you!! If your iPhone fell in water, be sure you let it dry completely while turned off before attempting to use it again. Set it in a bag of rice for 48 hours to 72 hours, or put it in a bag with a bunch of silica gel packets for 48 hours. It usually saves the iPhone, but be sure it is completely dried before it is turned on again or plugged in, electronics and water don’t mix. Good luck! Really hats off to you bro .. Try this. My phone was super stuck, but I mucked around with the bluetooth setting and it worked after absolutely nothing else did, blowing into it, cleaning it, taking off the cover. It had been in rain today and so I thought I was sunk! But no. I asked God to fix it, did my Rosary and bingo! Thank you Mother Mary! After swabbing with a q-tip (per recommendation from another website), I was frustrated that my phone was still stuck in headphone mode. I gave blowing into the headphone jack a try, swabbed again… Nothing! Inserted some headphones, firmly pulled out…and BAM! Good as new. I am so relieved. Did all three cleaning methods blew in the jack and also cleaned microphone hole next to it. Inserted headphones and pulled out FIRMLY and it worked! Thanks! AFTER TRYING EVERYTHING FOR 2 HOURS, the blow dryer trick finally worked! THANK YOU GUYSSS! Compressed air in a can and a QTip. Thank you!!!!!! This worked. My kids messed with my iphone 6 and I was worried and then I tried your suggestion and it worked!!!! YES. THANK YOU SO MUCH!!! It didn’t work the first time I plugged/unplugged but I did it about 5 more times and it finally switched over! Thank you so much. You saved me quite a bit of heart ache. I tried the q-tip and it worked flawlessly! Thank you so much! Just wanted to thank you for this – the Apple website was useless! I had a drink spillage that I thought had not entered any orifices but when I used the q-tip solution there was definitely liquid in it. Had to try a few times and it finally worked when I used a toothpick and a cloth (perhaps because the toothpick goes a bit further down). It’s working fine now! Thanks again! GUYS!!! I’ve had this problem for over an hour and I frantically tried everything before I factory reset it. Even the weird quirkier fixes. After I had backed my phone up to factory reset it, I took my sim card out to check the LDI (Liquid Damage Indicator) which was fine by the way. Put it back in and it’s gone back to normal!! Thank you so much! After cleaning it with q-tip i have to re-start it to work!!!! thumbs up! It really works! It worked for me. I was crying the whole time then it i tried this and it worked. Thanks to you! Unfortunately none of the above fixes worked for me but what finally did is when someone within my contact list called me. I missed the call by a split second and before calling them back I decided to toggle the volume again and it was now on Ringer!! I had tried calling myself from my phone and from Skype, and had also received two calls from blocked numbers that didn’t fix the problem. As soon as a friend called me, BAM, fixed after HOURS of trying the solutions above. So if all else fails, maybe get someone you know to call you and see if that helps. The q-tip idea worked fantastically. Thank you so much !! I’ve tried many times nothings happen.. Thanks to u holly ur tips really worked for me..
My iPhone will play music and videos with headphones mode but not without? Take a safety pin and a little bit of a q-tip and you can remove any debris in the jack! This worked straight away thank you!!!! Perfect! Really appreciate this. I was nervous. thank you soooo much! This has been really helpful to me! Can’t even express how much this helped. I really thought something was wrong with my phone! It worked immediately… I was under so much of stress and then I searched on the net and in a second, the problem was solved. There was a tiny piece of lint that came out along with the thin wooden stick I inserted in the phone jack. Thanks a lot! This helped me A LOT!!! Thanks so much this worked on my iPhone 6s perfectly. Turns out I had a piece of lint stuck in there and I got it out using a toothpick. 😊Thank you for the write up. Tried everthing above, my phone came off headphone mode when I left it on airplane mode for a spell. Thank you so so so much !!!!!! Unplugging the headphones in and out a couple of times then restarting it did the trick !!!!!! Hahahaha…I was thinking it was not going to work again..I tried blowing air…plugging unplugging ear phones but it never worked..!!! Thank you so much! Compressed air and insert/removal of headphones did it!!! it is just like cleaning the port. I tried the Qtip 7 times. It finally worked. Thank you so much!! Oh that’s great thank you so much, after cleaning headphones port , my mobile is now working . Awesome – cleaned it with a earbud and inserted the headphone jack about ten times – and it worked again! So many thanks for this. Today my iPhone fell into the toilet… Although I was quick to rescue it, the mentioned problem occurred. After blowing out with massive air pressure it works again. Great and thanks again!